14 Shade Tolerant Water Lilies - Aquascape, Inc. Many pond owners opt to locate their water garden in a shady location of the yard. This way, they can enjoy watching their fish while being protected from the heat of direct summer sun. While a shaded pond is ideal for cooling off in the summer, it can pose a problem for enjoying the beauty of water lilies. Most water lilies typically need a minimum of six hours of direct sunlight in order to produce beautiful blooms. Fortunately, there are a few hardy varieties that will bloom their hearts out with as little as three hours of sunlight per day. Following is our list of favorite shade tolerant water lilies categorized by color, along with their sunlight requirements. Toss aside the notion that you can’t enjoy water lilies if you have a partially shaded pond. 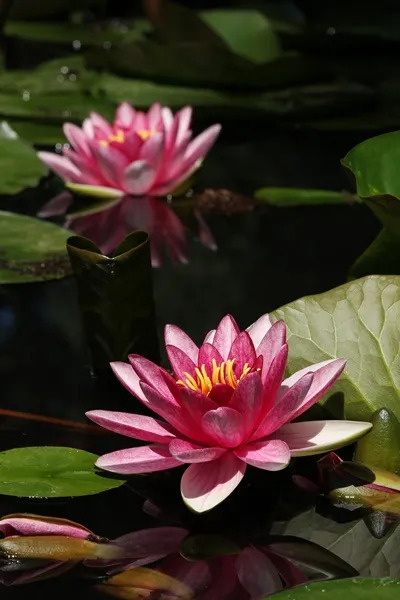 You can find shade tolerant water lilies at your local water gardening store, or you can order them online from a reputable aquatic plant retailer. Newer Post They Don’t All Have to Be Koi Older Post Why Are My Koi Fighting?